Recent strategies combining multiple modalities have opened up a whole new field of brain metastasis management focusing on disease control. The management of brain metastasis in modern times is no longer confined to palliation but seeks preservation of life quality and not only prolonged survival. Up-to-date guidelines and the main aspects of brain metastasis management as well as practical points on how to deal with difficult situations in daily clinical practice are presented. Epidemiology and biology and various effective treatment methods such as surgery, radiosurgery, radiation therapy and chemotherapy are well explained. Each chapter encompasses extensive reviews and presents broad perspectives on specific topics by the most renowned personages who have continuously shown their excellence in this rapidly progressing field. 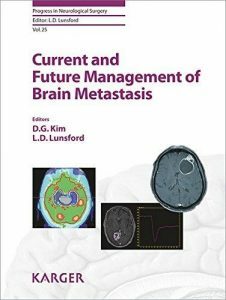 This book contains the most current information on the understanding of brain metastasis management. It is valuable reading for neurosurgeons, neuro-oncologists and radiation oncologists who are searching for the best all-round treatment for their patients.